Arsenal could be without Granit Xhaka for the visit of Newcastle on Monday, if the Swiss star fails to recover from injury in time. Xhaka picked up a minor knock to his thigh whilst on international duty with Switzerland, and had to be replaced during their 3-3 draw with Denmark. The 26-year-old had scored in the match as Switzerland raced into a three-goal lead, before his substitution in the 79th minute proved to be the catalyst for their capitulation. Switzerland manager Vladimir Petkovic said of his midfielder: “Xhaka could not stay on the pitch. The news could leave Gunners boss Unai Emery with a selection headache ahead of the Premier League clash with the Toon. Xhaka has been a consistent performer for Arsenal since Emery’s arrival, and scored in their last domestic outing against Man Utd. 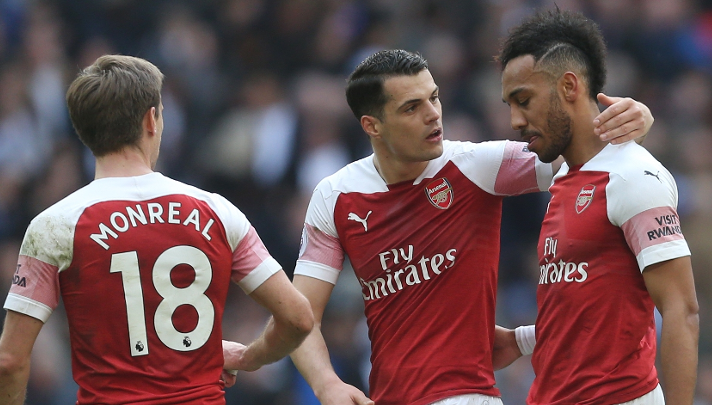 Arsenal will be hoping for the 26-year-old to return to fitness sooner rather than later, given they are in the midst of an intense battle for a top four spot. Sead Kolasinac, Sokratis Papastathopoulos and Aaron Ramsey all look like they will be available for selection. Ramsey could even deputise in midfield for Xhaka, should he fail to overcome his niggle.